What happens when a gifted student moves from one school district to another? How do parents obtain continuity of service for gifted students? How can you make the transition as smooth as possible? When gifted kids move, it can be trickier than it is for typical learners. The same is, of course, true for students with other special needs as well. I’d love to hear your thoughts on how gifted students are transferred between school districts. We just moved from Texas to Colorado and I had to jump NUMEROUS hoops to have their GT credentials acknowledged and get them placed in appropriate classes. In the meantime, the process left my girls feeling like they were inadequate and not welcome. People move, and when they move kids with different needs can be caught in a web of bureaucratic hot mess. There are many things parents can (and should) do to make this process more smooth and less distressing for their children. Unfortunately, this is a topic that isn’t really discussed very often, so I’m grateful for this question and the opportunity to respond to it. If you have a question about your child, your student, best practices, or anything Giftedesque, shoot me an email or message on Facebook, and we’ll see what we can do! There are specific steps parents can take to pave the way for a smooth transition for gifted kids moving. Knowledge is power. Before you move, explore the policies of the district to which you’re moving. What are their policies about about transfer students? What are the measures they use to identify students for gifted services? What are the scores they require of their own students? Is there a gifted parent group? Don’t just take someone’s word for it. Read the school board policies. They can be difficult to find, but they’re there, and they often get misapplied, so forewarned is forearmed. In some states, gifted services are under the special education services model and have very strict timelines. The child will be served with what is called an ALP (Advanced Learning Plan) or GIEP (Gifted Individualized Education Program). The level of bureaucracy may be greater than you were previously used to. The time to find out that it will not be as simple as moving from one GT program to another seamlessly is not when you’re unpacking boxes in your new home. In the article I wrote about whether a child is gifted or just bright, I discussed that gifted services in school districts are not declarations of identity, but rather a service model match. Different districts have different needs and resources, and a child who qualifies for services in one district may not qualify in another. For example, some districts play fairly fast and loose with what they define as gifted. They may only require very low scores or only one qualifying subtest score. They may do this in order to serve a wide range of students, they may do it because they don’t have enough students who would qualify with more strict means, they may have large budgets, the list goes on and on. Other districts have much more narrow admissions criteria or they would have more identified students than they could possibly serve. In my state (Texas) no matter how many students are identified for services, the funding is capped at a certain percentage. Any students identified above that percentage are then served with no funding help. Because of this, it is unreasonable to expect that kids who qualify for services in one district will always qualify in every other district. Reach out to the advanced academics department in the new district prior to the move. What documents do they need? Make sure you carry sealed, official copies of these with you. Don’t wait for the former school to send them. You may need to obtain these while the former school’s office is open, so don’t expect to get these in the middle of July. Plan ahead! How quickly can the process of transition be completed? What happens in the meantime? If the testing the previous district did isn’t accepted, is private testing acceptable? If the answers to any of these questions are distressing, you may have some serious decisions to make. Resolve that you will work to change the policies that are unfair or overly burdensome. Don’t forget once you’re all settled in. Pave the way not only for your own child, but also those who will come after. When you’ve received answers to your questions, it’s time to make a plan. If the transition is going to be less than ideal, plan it out. What will you do if your child simply doesn’t qualify for services in the new district? How will you keep your child in the loop but not distressed through the process? How will you approach the classroom teacher with your child’s needs in the meantime? How will you avoid projecting your own frustrations onto your child and thereby undermining him/her in this delicate process? What will you do if the process is not as described? Who are your contact people? Can you keep a record of whom you’ve talked to and when and what they said? Look for advocates in the incoming district as well. Who are the champions of the gifted kids? If there’s a parent group, join it! Join NAGC and your state affiliate. Make sure you keep your child in the loop about how the process will work and what they can expect. Explain that different districts handle these processes differently. It doesn’t mean that they’re not welcome; it means that there are processes that can take some time. Make sure they know that they don’t need to worry about the process. You will take care of it. Their only job is to get to know their new teachers and classmates and routines. Parents are the bulwark between this process and their child. Be that bulwark. Allow no negativity through. Even though this process (like so many) can be stressful, try to stay positive. Try to see it from the point of view of an adventure or try to keep notes about what happened that may help others in the future to navigate the same waters. At all costs, avoid speaking or even implying frustration or negativity in front of your child. They pick up on even the most subtle comments, sighs, and eye rolls. Starting out with negative feelings about their new school home can do more damage than temporary denial of gifted services. While the focus of this article is on what parents can do, I’ve got some tips for school districts, too. The difference may seem subtle, yet it’s important. Advanced Academics departments should be determined to seek out as many students as they can serve, not behave like bouncers at the door to an exclusive nightclub. Enlist your parent group to serve as ambassadors of your program. Share with them the strategic vision of the program and enlist their help in coming up with cruelty-free transition process policies. If your district has a lengthy (more than four weeks) transition process, be very honest about what you offer high ability kids in the regular classroom. I don’t just mean being honest with parents who ask. I mean being honest with yourself. I’ve seen too many districts that say that all of the teachers differentiate, and then when I work with the teachers find that few, if any, really do. If you know you have constraints on how many students can qualify, so have a clear plan for how you will serve those who don’t and how you will explain the process to parents with grace and respect. Put it up on the district’s website. Consider having an FAQ section where you address the common questions you are asked. Don’t play games with kids’ lives. At all costs avoid a shell game of hiding information. 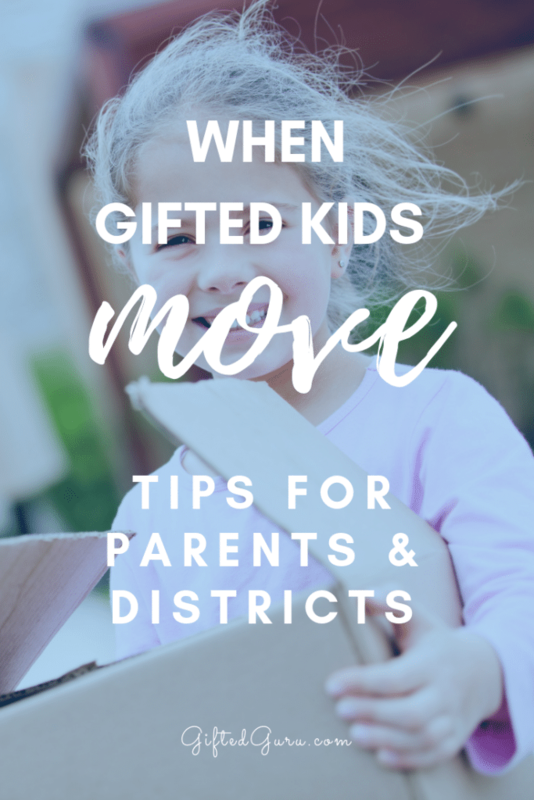 If your district’s gifted criteria are more narrowly restricted than is common, have a plan for how you will serve those who move in who previously received services they no longer qualify for. And make it a good one. If you are in doubt, let ’em in. If they score is a point or two away, let ’em in. Why do I say this? Because the tests are a snapshot not an MRI. Even though tests seem objective, they still have a margin of error. They don’t tell the whole story. Allow parents to submit letters of support from previous teachers. Consider allowing portfolios of actual work in addition to plain testing. If the child is from a military or diplomatic family, consider allowing automatic admissions of previously identified students. These children, whose parents sacrifice in service to their country, have children who sacrifice as well by being moved from place to place. Forcing them to prove over and over again that they qualify for services is unjust, unkind, and unpatriotic. 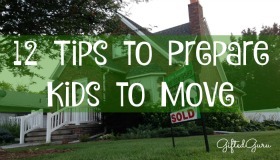 Most kids who move do so to neighboring districts. While you may not have to go far to have a very different student base (and, therefore, vastly different needs/requirements), you can share information and align policies as clearly as possible. If not, can we offer temporary reciprocity during the process? That has its own problems, but it’s a start. Can we have one-to-one correspondence for certain measures, such as teacher evaluations? For example, the CogAT and OLSAT have the same mean and same standard deviation, and test very similar abilities. The WISC (any version) and other actual IQ tests can be looked at by percentiles for commonality. Can we have a streamlined process for students moving short distances? Moving is never easy, and moving with gifted kids is sometimes harder than it needs to be. Hopefully, these strategies can help parents and districts make the process as seamless and fair as possible. 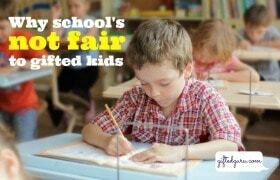 Fair policies are a key factor in gifted advocacy, and they should be the concern of all.